Quinoa is an extremely healthy seed that is packed full of protein, fiber, and other nutrients. Many people view quinoa as a superfood because it contains all the amino acids your body requires. The benefits to your health of consuming quinoa include boosting your immunity, improving your cardio health, supporting healthy digestion, and helping you lose weight. One of the reasons why so many people enjoy the health benefits of quinoa is because it is gluten-free. Quinoa is also healthier for you than rice because it contains high levels of minerals such as manganese, magnesium, iron, and phosphorus. The fact that quinoa is high in antioxidants means that this superfood has multiple health benefits. In this article, you will find out what science says about this wonder seed. You will also learn about the many reasons why eating quinoa is so good for you. At the end of the article you will also find a simple recipe of delicious and gluten free quinoa fritters with tzaziki. Quinoa is called a pseudo-cereal because it has similar nutritional content to whole grains even though it is a seed. Quinoa is a unique seed because it is a complete protein and contains all the 9 essential amino acids a healthy body needs. Quinoa comes in many different types and colors with white quinoa being the most common. However, you can also buy red quinoa and black quinoa. Some people say that the difference in taste between red quinoa and white quinoa is that red quinoa has a richer, nuttier taste. There are many reasons to call quinoa a superfood. Quinoa is good for you because the high nutritional value of this wonder seed means that this is a complete food source. Quinoa also has a unique nutritional protein content because it is high in amino acids. Research has found that quinoa contains good amounts of amino acids threonine and lysine. (6) These are some of the 9 essential amino acids that you need to get from your diet because the body can’t synthesize them, and quinoa has all of them, hence it is a completer protein food. Quinoa is quite high in carbohydrates. 100 grams of quinoa contains 39 g of carbs which is 13% of your recommended daily intake (RDI). However, from these carbs, 100 g of quinoa contains 5.2 grams of fiber, giving you 21% of your RDI of fiber. (7) However, some varieties of quinoa may contain even more fiber. The high carb content of quinoa means that quinoa is not a “keto” food and most people avoid quinoa if they follow a low-carb keto diet. In addition to these minerals, quinoa also contains amounts of calcium, potassium, zinc, copper, and selenium. Eating 100 grams of cooked quinoa will also give you plenty of vitamin E and B-group vitamins. Another reason why quinoa is such a good food for your health is that it contains high levels of antioxidants. Antioxidants are necessary to protect your immune system and prevent DNA damage in cells that can lead to chronic disease. Quinoa vs. Rice – Which is the healthiest? When it comes to comparing if quinoa or rice is healthier, it would seem that quinoa comes out on top. Quinoa contains more protein, amino acids, and micro-nutrients than brown rice. Comparing the calorie content of brown rice and quinoa, 100 g of cooked quinoa only has slightly more calories than brown rice. Let’s look in more detail at the many reasons to eat more quinoa in your diet. Consuming more quinoa can boost your digestive health because a cup of quinoa contains 21% of your daily fiber requirements. One study found that, depending on the type of quinoa, 100 grams of raw quinoa contains between 10 and 16 grams of fiber. (10) Because it absorbs water when cooking, cooked quinoa gram for gram has less fiber than raw quinoa. A diet containing mineral-rich foods and fiber such as quinoa can help boost your cardiovascular health. Learn about some of the other great foods that can help boost your heart health. Quinoa is a great food choice if you are on a gluten-free diet. Quinoa is naturally gluten-free and is a delicious alternative to grains like wheat, barley, and rye. Do you know how to spot the signs of gluten sensitivity? Intolerance to gluten could be the reason for digestive upset like having diarrhea after eating. Quinoa is one of the best plant-based protein sources that you can include in a healthy, well-balanced diet. 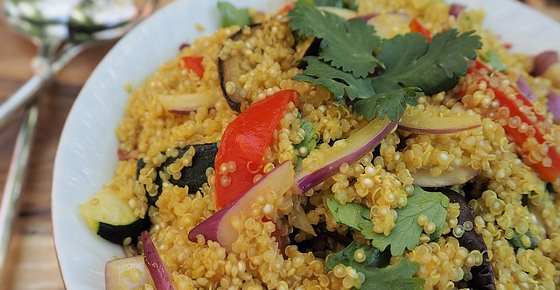 Quinoa is a popular choice of food among vegans and vegetarians because its protein content is so high. One cup of cooked quinoa for breakfast or your meal will give you 8 grams of protein which is 16% of your daily protein needs. What’s more, you get all of your 9 essential amino acids. Find out about more excellent sources of protein that are 100% meat-free. You can also learn why lysine is so essential for good health. Quinoa contains minerals such as magnesium, calcium, manganese, and phosphorus which are necessary to keep your bones strong. For example, 1 cup of cooked quinoa contains 30% of your magnesium RDI, 28% of phosphorus, and 58% of your manganese RDI. One cup of quinoa also contains 31.5 mg calcium (3% RDI). Consuming more quinoa every day in your favorite smoothie (cooked quinoa is soft and blends easily in smoothies), using it instead of oatmeal or rice, or sprinkling it over your dish can help prevent mineral deficiencies that require taking supplements. Because quinoa is such a great source of protein that is relatively low in calories, you can eat quinoa if you want to lose weight. Eating quinoa with a healthy meal can help to manage symptoms of diabetes because it helps to prevent blood glucose spikes. Find out what other foods you should eat to help prevent type 2 diabetes. Consuming more of these foods is good if you have some of the signs of diabetes. One cup of cooked quinoa contains 2.8 mg of iron which is 15% of your iron needs for the day. Regularly consuming quinoa can help prevent a lack of iron in your body. If you are showing signs of an iron deficiency, find out about the best iron supplements to take and how to get enough vitamin B-12 in your diet. Are there any adverse effects of consuming more quinoa in your diet? According to doctors from WebMD, quinoa is a high-protein, gluten-free seed that can be enjoyed by almost everyone. There are no known side effects of consuming quinoa as a food. Quinoa is generally available in packages and bulk bins. If you cannot find it in your local supermarket, look for it in health foods stores. The most common type of quinoa you’ll find in the store is white quinoa, but red and black quinoa are also becoming more available. You may even be able to find a tri-color mixture sold in packages or bulk bins. It is best to store quinoa in an airtight container. Quinoa will keep for a longer period of time, about 3-6 months, if stored in the refrigerator. When you cook quinoa, always rinse it with water because quinoa is coated with toxic chemical called saponin. To do it place the quinoa in a strainer and run cold water over it until the entire soapy residue has been washed away. You can taste test a few seeds; if they still have a bitter taste, run more cold water over them. Rubbing the seeds while rinsing with water takes away even more bitterness. Then add one part of the grain to two parts liquid in a saucepan. After the mixture is brought to a boil, reduce the heat to simmer and cover. One cup of cooked quinoa in this method usually takes 15 minutes to prepare. Since quinoa also contains phytic acid, a substance that can bind to certain minerals and reduce their absorption (19), you can soak quinoa before cooking it to reduce the content of phytic acid and increase the bio-availability of the minerals. You can read more about it in my article on why you need to soak nuts and seeds. If you have some quinoa leftovers, try this delicious quinoa fritters. It can be served with tzaziki which is a nice and easy Greek dipping sauce for veggies, Greek salad, grilled meats and pita bread triangles. There are many variants of tzaziki recipe, but you can always adjust the seasoning and quantities according to your own taste. Mix all the ingredients in a bowl. Add 2 tablespoons of olive oil to a medium fry pan on moderate heat. Using a tablespoon grab a handful of the mixture then place in the pan and flatten a little bit. You can place several of the quinoa fritters in the pan, but don’t let the edges touch each other. Cook for a few minutes on each side until lightly golden and drain the oil on paper towels. Repeat with the rest of the mixture (you may need to add more olive oil between the batches). In a medium bowl, whisk together the yogurt, cucumber, garlic, lemon juice (and zest) dill and mint/parsley. Season with salt and pepper. Pour into a serving dish, cover tightly, and refrigerate for at least one hour before serving.